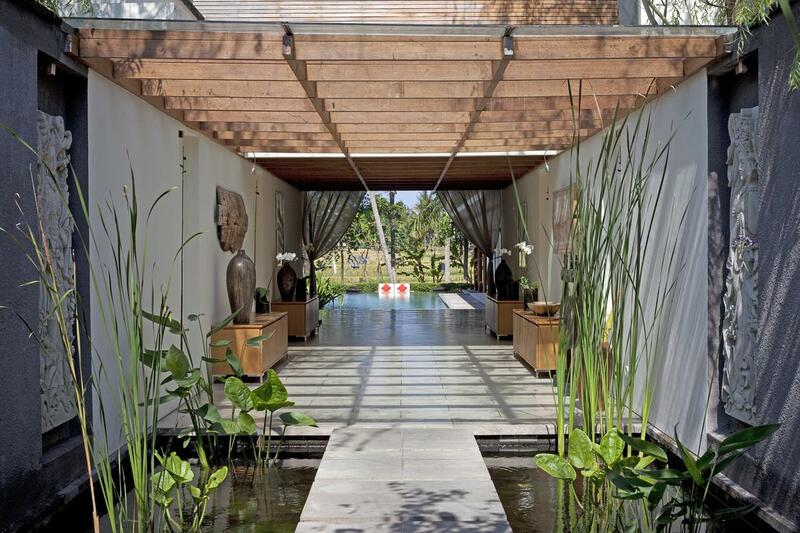 The villa comprises a large open-sided living pavilion and a two-storey building arranged in an L shape around an 18m x 5m swimming pool looking onto rice terraces. The open-plan living pavilion has a formal seating, dining and media games area with a bar counter separating the guest kitchen and, beyond, a second service kitchen. 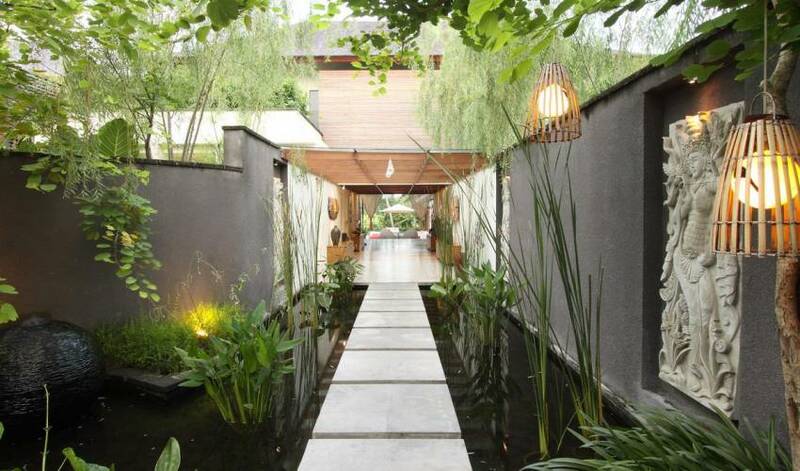 Attached to the end of the pavilion is a large pergola with further seating. 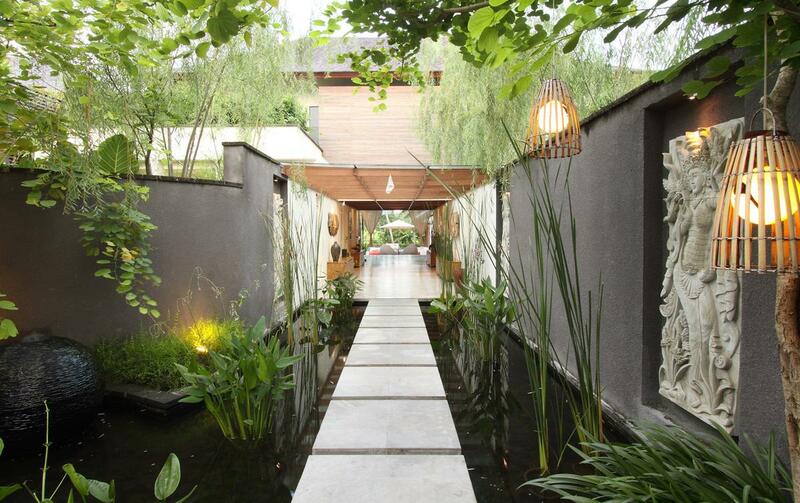 In the second pavilion, which is fronted by a covered terrace on both storeys, two ground-floor master suites flank a central ‘art-gallery’ foyer leading to the main entrance. Stairs lead up to the second level where two more guest suites and a plush home theatre open onto the terrace. 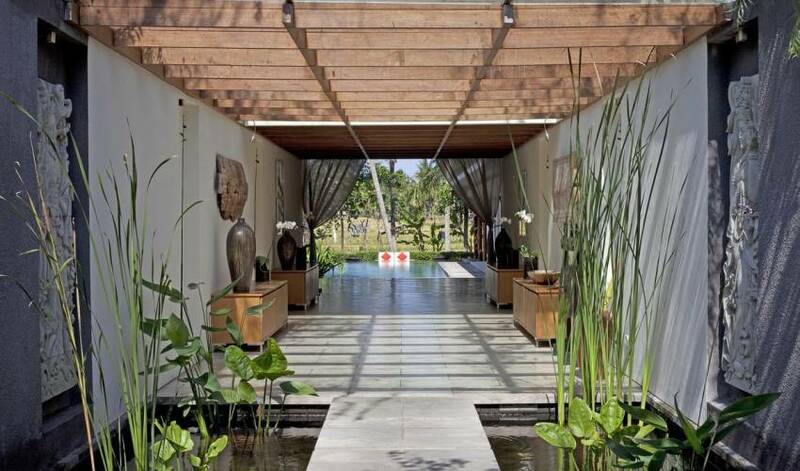 An unusual feature at this villa is the grass-carpeted ‘living roof’ of the large open-sided, fan-cooled living pavilion visually linking the villa with the neighbouring rice fields dotted with shrines to Dewi Sita, goddess of rice and prosperity, and the inspiration for the villa’s name. 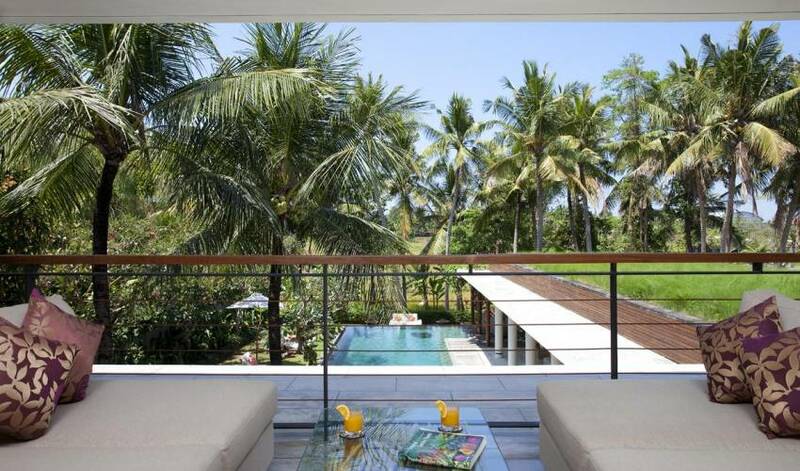 This is the place for lavish entertaining, between waterfall walls to one side and an 18-metre azure pool lined with mature frangipani trees to the other. There’s a formal seating area with deeply cushioned cream sofas arranged in a convivial U shape for easy conversation. The huge dining table hewn from a single slab of suar-wood seats 14 in splendour at Philip Starck-style ghost chairs. In the middle, recessed into a wall of display cabinets and flanked by tribal artefacts and objets d’art is a 47-inch TV with satellite channels, DVD player and Bose sound system where kids of all ages can flop onto brightly coloured beanbags for an afternoon’s Wii gaming. A granite-topped bar counter separates the open-plan guest kitchen and staff kitchen beyond, equipped with welcome extras such as espresso machine and wine fridge. The upper-level multimedia room is cocooned with wall-to-wall shag-pile carpet, padded walls and masses of plush oversized sofas and beanbags facing an enormous projector screen with home theatre incorporating a hard drive loaded with 300 movies. There’s also an electric piano in this room. The shaded terraces running the length of both floors of the two-storey wing accord further relaxation areas, with double swing seats suspended from the ceiling on plaited ropes, and a scattering of sofas and daybeds for afternoon siestas. 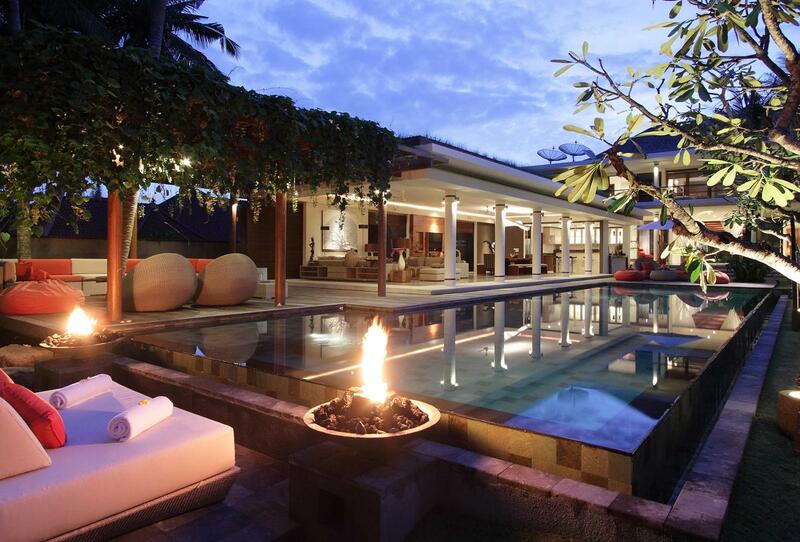 There’s lots of outdoor living space too. 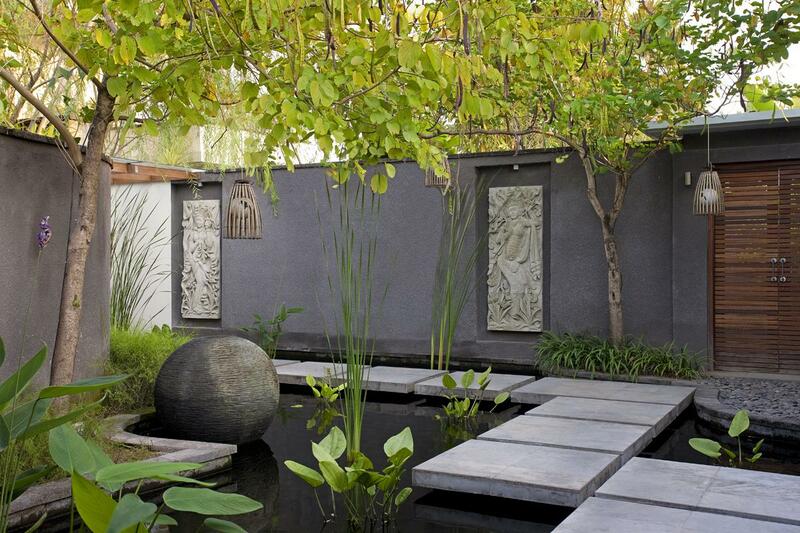 Between the living pavilion and rice terraces is a large seating area with ironwood decking wrapped around palm trees that tower above a pergola roof draped in flowering vines. 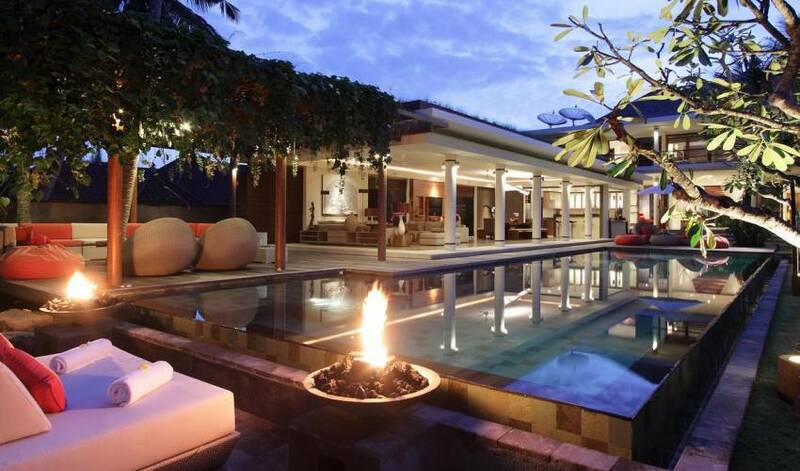 From here, it’s a hop and skip to the shallow end of the green java-stone pool, with jacuzzi jets and a pair of fire-bowls. 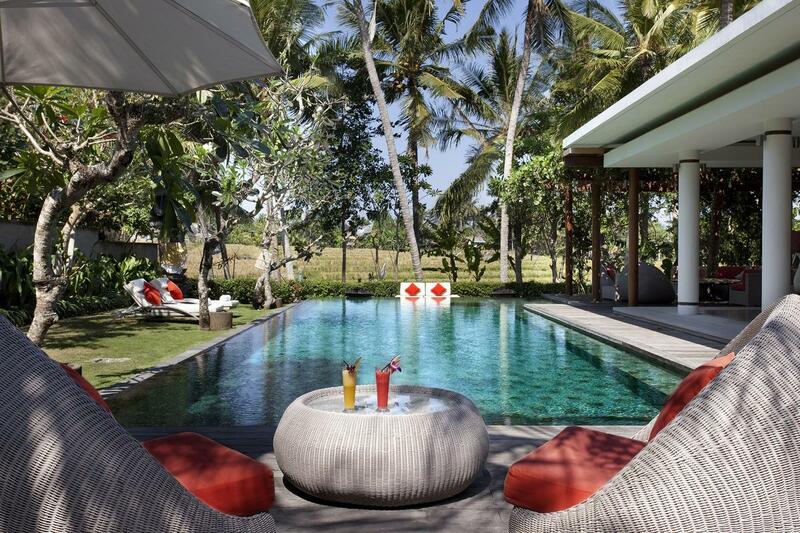 A double sunbed, four sun-loungers and wicker seating furnish the lawn of soft Japanese grass. 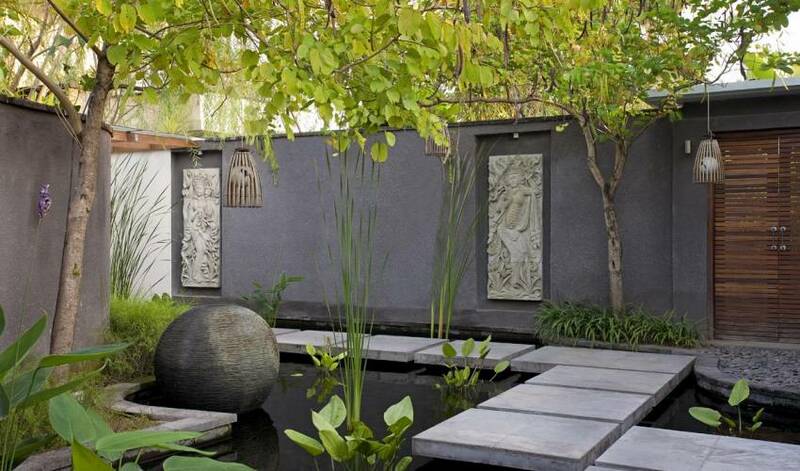 For perfect privacy, guests may retire to their peaceful bedroom garden or terrace. 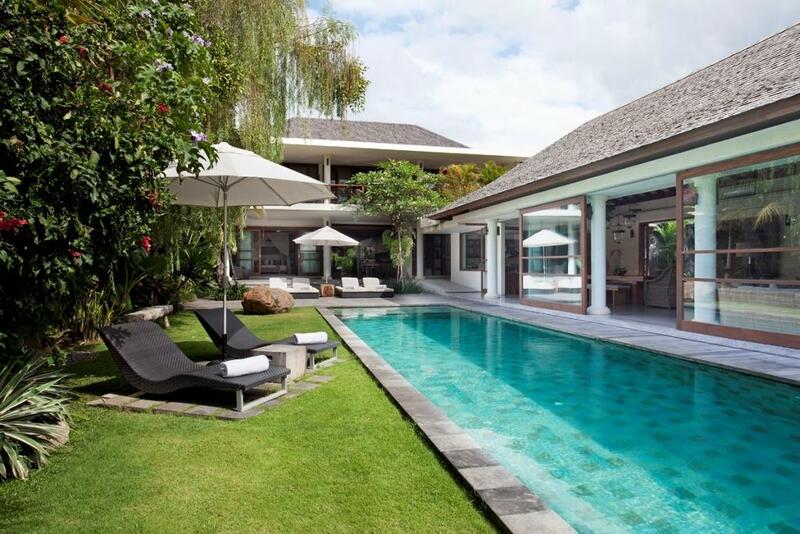 The villa offers four spacious bedroom suites with walk-through dressing areas and light-filled bathrooms that spill onto either a private garden or terrace. Each bedroom comes with an iPod dock, 32-inch TV with satellite channels and DVD player, a choice of air-conditioning an overhead fan, and a window seat that converts to a single bed for extra guests. The two ground-floor master bedroom suites feature king-size beds on reclaimed teakwood floors, large dressing areas and equally generous bathrooms with twin vanities, rain shower cubicles and terrazzo- or granite-surround bathtubs looking onto private gardens beyond. Two upper-floor guest bedrooms offer the flexibility of twin beds that can be joined to make a king, an indoor shower room reached via the walk-through dressing area, and a small well-screened and completely private sun-terrace. 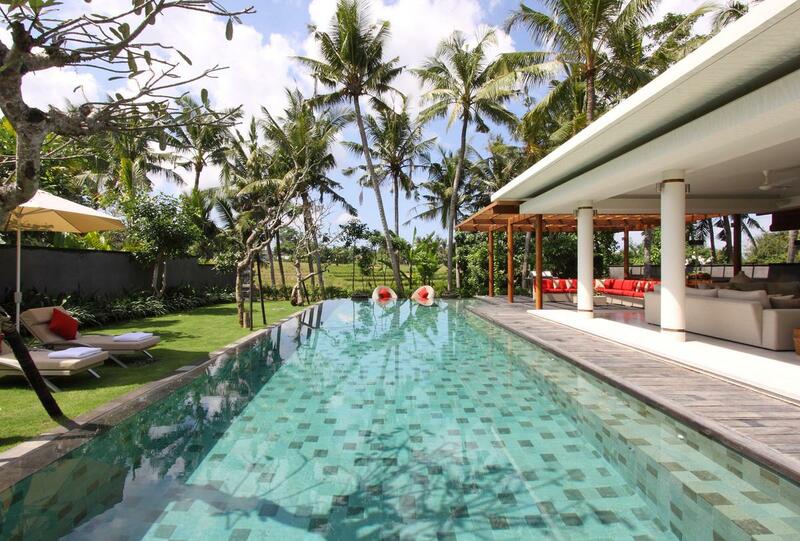 The villa is located on a quiet side road in Berawa close to Canggu. 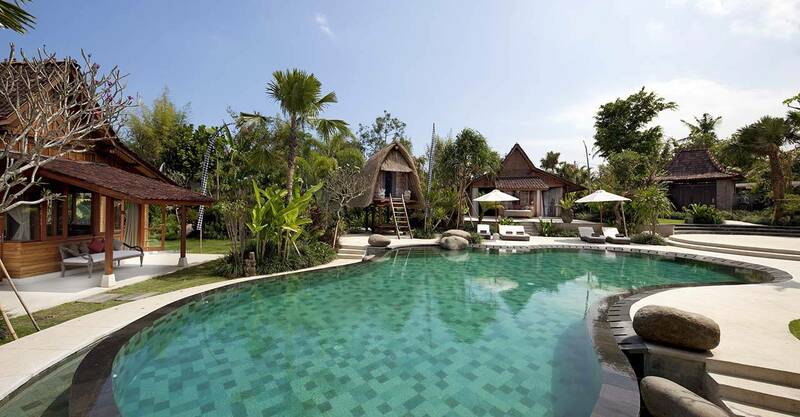 Dotted among the rice fields are luxury villas, local communities, and an increasing number of restaurants and spas. 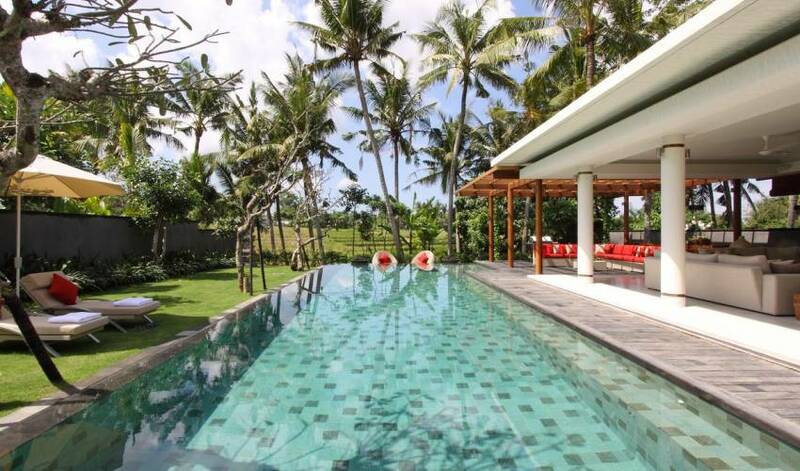 Berawa Beach is less than a kilometre away, as is the Canggu Club where guests enjoy complimentary membership during their stay. 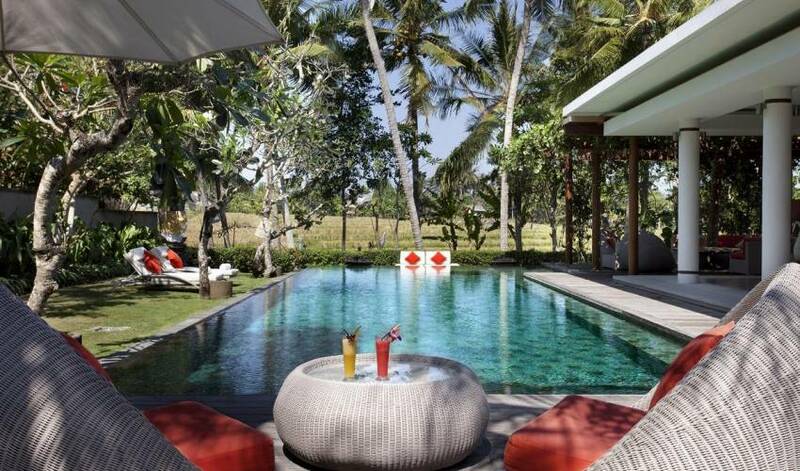 Only ten-minutes away (courtesy of the villas’ car and driver) are the famed restaurants, bars and boutiques of Seminyak. 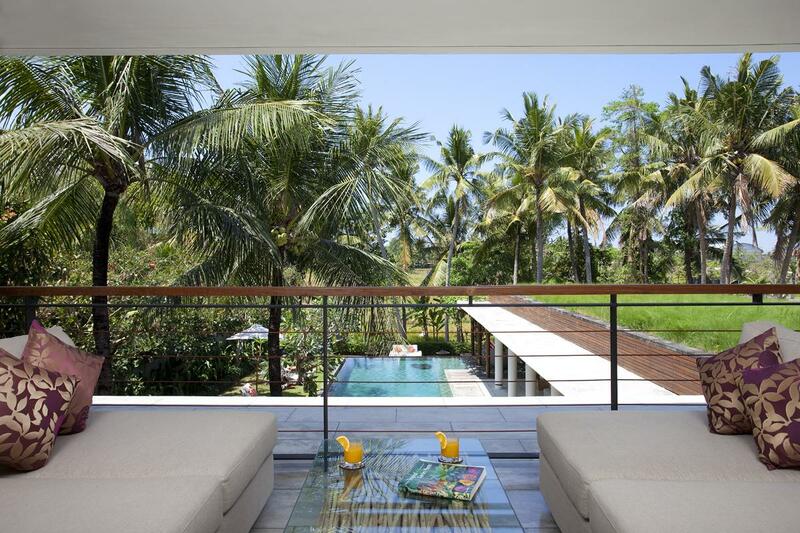 This rural, close-to-the-beach setting, with easy access to Seminyak, gives guests the best of both worlds and no shortage of things to do.